Kath Sands, former professor of religion at UMass-Boston, and her partner Linda Krieger, an attorney, have a marriage license in Massachusetts. But last year, they moved to Honolulu, where they both teach at the university–Kath in American Studies, and Linda at the Richardson School of Law. Linda grew up in Hawaii, and so it was a homecoming of sorts. But here in Hawaii, their marriage isn’t recognized. Like us, they have joined the struggle to pass a civil unions bill this legislative session. 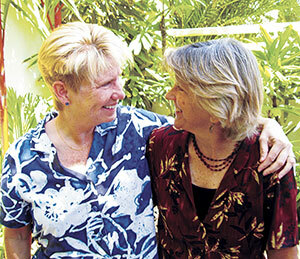 This week’s Honolulu Weekly, features Kath and Linda in an extraodinarily moving story by the paper’s editor Ragnar Carlson.Â There haven’t been many stories that cover the challenges for married Massachusetts couples who leave our state–and with few exceptions–have to leave the legal recognition of their relationships behind as well. As Carlson says, “For Kreiger and Sands, who had preiously enjoyed equal status under the law, the transition was rough.” Read the full story.